Here's the mosfet solution that I've been working on. It seems to work except that LTSpice says that the gate is seeing the pulse (V[n003]). Changing the delay is just a matter of changing the value of R1. Edit: I'd been measuring the gate to ground and should have been measuring gate to source. I got a little help with that and now it shows the correct plot. So, we have two working solutions now. 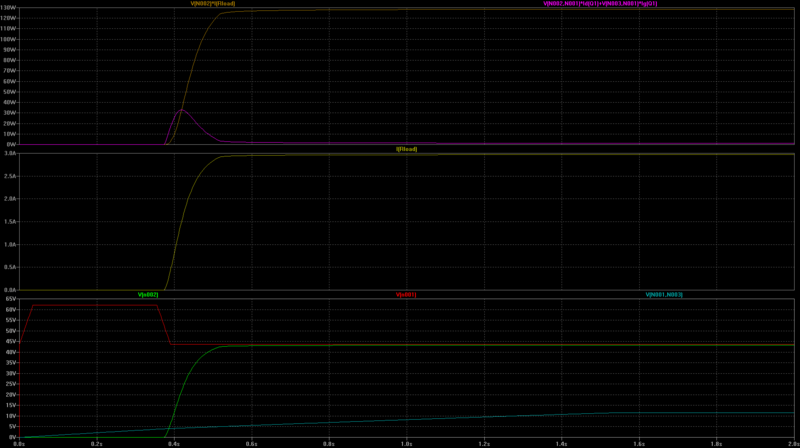 This one may be a little better because of the voltage drop across a traditional transistor. I did some testing with the TIP141 and 5 amp load and nearly burned up the TIP because I didn't have a decent heat sink. I put the Tip on medium sized heat sink and noticed the temperature rise to about 125 C which was hotter than anything else on the board, even the output transistor heat sink. I wonder if I miscalculated something. I thought operating more or less like a switch would not generate that kind of heat (except at start up). 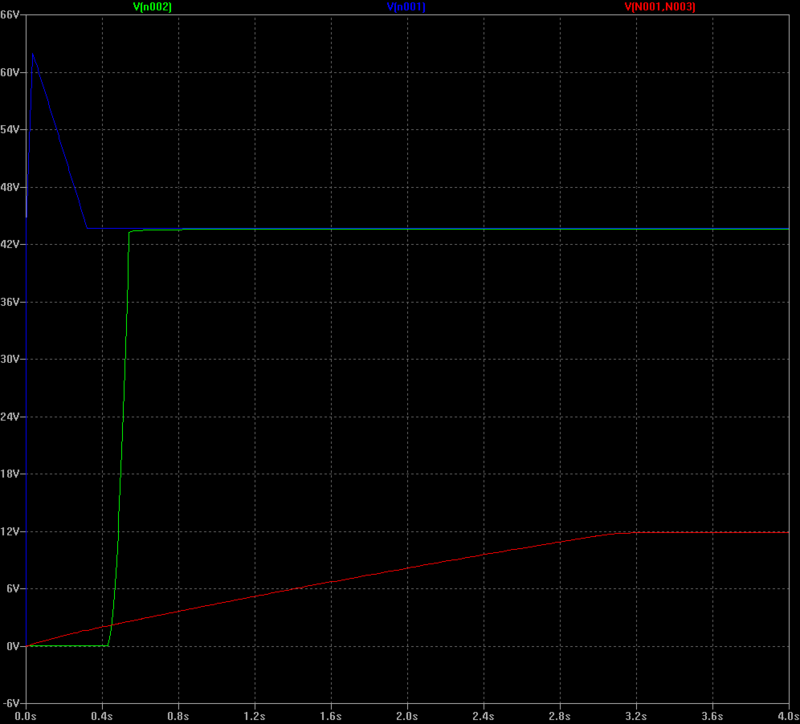 I was thinking that the voltage drop when fully on would be about 1.2V at 5 amps or 6 watts. I'm definitely burning more than 6 watts. The other thing I noticed is that the turn-on delay was nearly triple or about 3 seconds. That's definitely not a good thing. You wouldn't happen to have a PFET to test my theory out with would you? I haven't fully finished the simulations yet because I want to test using a load as well but I've just now figured out how to work some of the basic stuff so it may take a little time. Edit: For example, here's the results with a 3A load. I may be modelling things wrong but things definitely changed when I added the correct load for 3A and a 3A current source. I rearranged some values and redid the plot. If I'm doing this right, the power looks good for the zener and the mosfet so there doesn't seem to be any issues there. I put in the filter cap too because it's part of the circuit right before the mosfet and I wanted to make sure it didn't alter the results. You wouldn't happen to have a PFET to test my theory out with would you? No, I don't have any beefy N or PFETs. I'll probably order some in a week. I have a boatload of NFET's but I don't think I have any PFET's. I'll look around to make sure because I have everything else I'd need to test this and it would be a shame if I didn't at least have one. I think I'm starting to get the hang of this after doing a bit of reading. Here's the results with things set correctly if I'm reading everything right. Edit: After getting some feedback and doing a bit more research, I think I've finally got something that gives fairly good results. I'll have to wait to test it but hopefully this is a solution that works. Redwire, can you give us a screenshot of pin 7 to pin 4 of U1 and U2 with 5V/div @ 500ms/div? I'd do it myself but no DSO. We've been discussing the shots you did here and here and the consensus is that this is RFI at the switch contacts or something like that. What I'm really curious about, and I can't take a picture of, is what the two op amps are seeing at power up across their power pins. The consensus of many people that work in the industry is that this design is a fail and that it should be scrapped and redone. I've heard this several times from several people. I'm not ready to give up on it myself but that could just be my OCD talking. I think it works very good other than the surge problems. 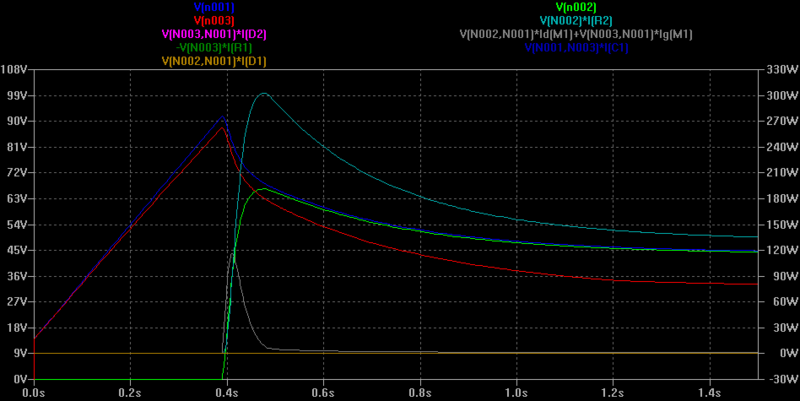 Here is U2 at 12V at startup with 0.5 amp load. Second try was a bit shaky as it was just holding against pin 7 while trying to plug in the transformer. Excellent, that's what I wanted to see, thanks. I'm trying to get a few more eyes on the problem and was asked about the voltages across the voltage pins for those op amps. 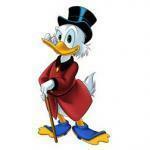 One of these days I'm going to get at lease a cheap DSO. These actually look pretty good to me but I'm no expert. That was the consensus by Tim too. I'm wondering if the 2N3055's are at fault here in some way by allowing voltage and current through at power on by being hit by the initial surge. Is that possible? Would a higher Vceo help with that? I'm certainly no expert either but since I started using LTSpice, I've been learning a bit faster than I was. It's a neat program once you get used to how it works. What is the direction of the applied dc voltage solution. I guess nobody replied is because we cannot understand your broken English. 1) "Remove AC source". Turn it off? 2) "Direction". North, south, east or west? 3) "Applied DC solution". DC applied to what? Solution of what problem? 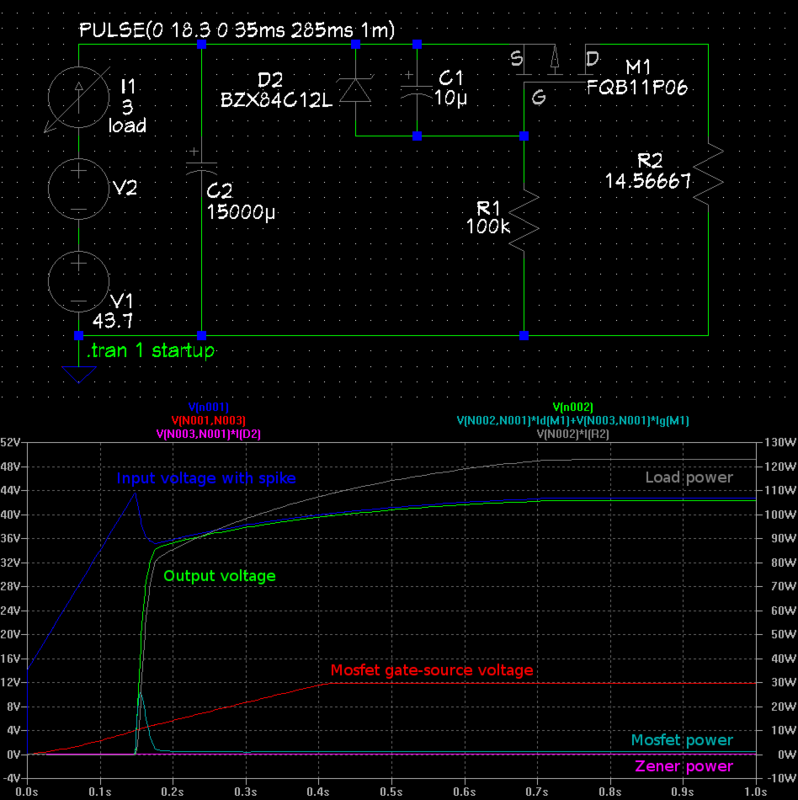 What software can simulate the circuit. in it and probably should have deleted this one as well. They don't like it because we've implemented more aggressive spam measures but at least it's wasting their time. I'm interrested about 0-30 VDC STABILIZED POWER SUPPLY WITH CURRENT CONTROL 0.002-3 A and have couple of questions. -Is it possible to inpute dc voltage apply? This is my version of the PSU , All tested all working no problems complete with PCB and BOM aslo with connection drawing, I mounted the transistors on a seperate PCB but you don't have to use the PCB you can just hard wire them. Hello, just a little curiosity: I've already built one based on the Rev2 (March 09), now I would like to try to build this one. ). The 3A version uses two output transistors with emitter resistors. The 5A version uses three output transistors with emitter resistors. Second question: The TB4 port should host a Shunt Resistor, this is used to measure the current value right? The 3A version uses two output transistors. Each emitter resistor has a max voltage of 1.5A x 0.33 ohms= 0.5V across it. When the output voltage is shorted or is low then each output transistor heats with (30V - 0.5V) x 1.5A= 44.25W. The 5A version uses three output transistors. Each emitter resistor has a max voltage of 1.67A x 0.33 ohms= 0.55V across it. When the output voltage is shorted or is low then each output transistor heats with (30V - 0.55V) x 1.67A= 49.2W. But both versions use a single BD139 driver transistor which heats a little more in the 5A version. The peak voltage of a 28V transformer is 28V x 1.414= 39.6V. If the output voltage is low or is shorted with 5A of current then the transformer must deliver 39.6V x 5A= 198VA so a 200VA transformer will be hot but will be fine. If the transformer is 30V then it will be a little overloaded (212VA). The circuit is designed for a max current detection voltage across the shunt resistor of 1.4V so the 3A version uses 0.47 ohms (3A x 0.47 ohms= 1.41V). The 5A version uses 0.27 ohms (5A x 0.27 ohms= 1.35V). It is simple to calculate the heating (power rating) which is 5A squared x 0.27 ohms= 6.75W so use a 10W resistor which will get pretty hot. So if I add one more output transistor in the output stage of the PicMaster's circuit, should I be able to get 5A out of the power supply? Sorry if the question sounds dumb, I just wanna be sure. Does the schematic need other changes (different values on other resistors etc?). 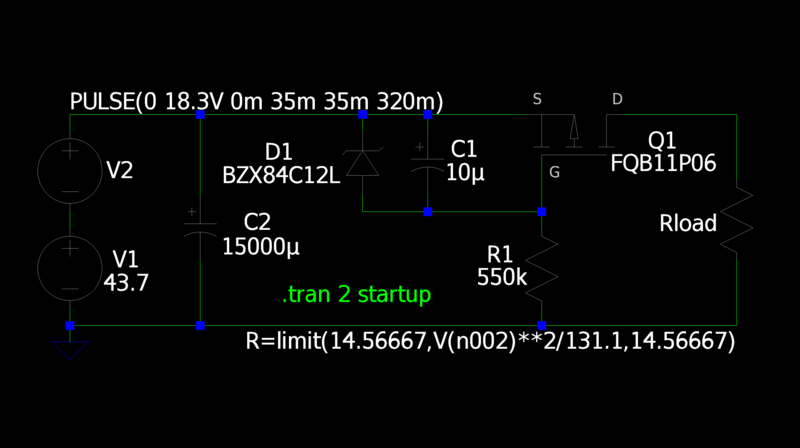 I have Picmaster's schematic of 10/10/2010 and it says 5A but it has only two 2N3055 output transistors that will fry. It might have other problems. 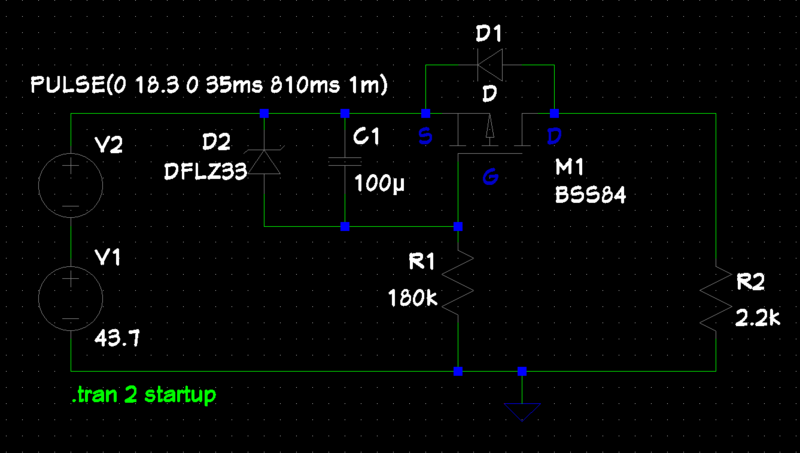 I have Picmaster's schematic of 10/10/2010 and it says 5A but it has only two 2N3055 output transistors that will fry. It might have other problems. Do you mean in terms of reliability? Do you mind if I ask you to point me out to the most reliable schematic versions (of both 3A and 5A) at the moment? I've seen there're a lot of custom versions, I'm a little bit confused about which one to choose. I did not look at everything on Picmaster's schematic to see if it has any more problems.